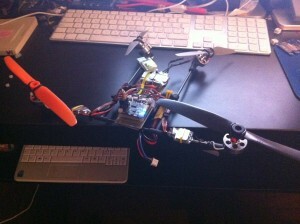 I have problem with my bigger quad (one esc does weird things raising throttle) so i cannot fly for now. So It was time (while waiting for my holidays) to finish a mini vtail quad I had in mind for a lot of time. I is basically built around some 4mm carbon fiber tubing and some kite rubber joints. I used a 4mm kit and a 6mm kit. The 6mm provied the joint used to hold the four motors while the 4mm was used for the remaining joints used to build the structure. 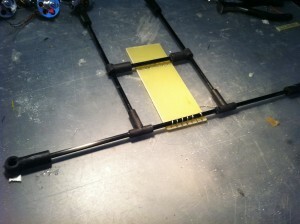 The rectangle was epox’ed to the tubes after it was tied using some wire. 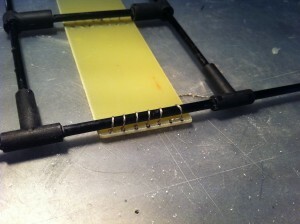 In the rectangle there are four rows of holes used to let the wire passing through it. Here is better shown how it is tied. 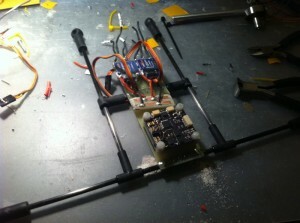 After the base frame was ready I started to put the electronic on it. 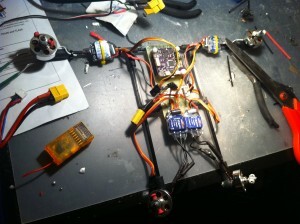 Here there are two escs, a simple ditribution board and the CopterControl that will power the Vquad. In this pictures it is almost complete. all the wirings were done and all is ready for testing motors. The weight is a little less than 300gr with battery.